Irving, a proud admirer of Adolf Hitler and an open antiSemite, claimed Lipstadt had defamed him by describing him as he is: a violently biased distorter of recorded history. The ensuing trial required Ms. Lipstadt, a respected scholar and teacher, to examine and reexamine details of Holocaust history. In the course of the trial, Ms. Lipstadt was approached by numerous survivors of the Nazis’ attempted genocide who encouraged her to represent them with her voice. 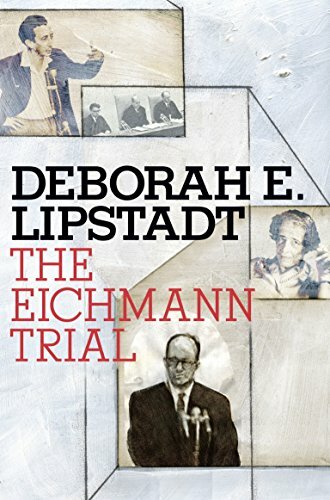 The author is careful to state that her widely publicized trial—in which she was cleared of the charge of libel—was not at all analogous to the trial of Nazi war criminal Eichmann. However, many of the insights she gained from that experience guided her research in preparation for the current volume. Ms. Lipstadt points out that prior to his capture by Israeli agents, Eichmann lived in comfort in Argentina. His presence there was known by the American Central Intelligence Agency, but they choose not to reveal his whereabouts. This, according to the author’s research, was discovered in 2006 when a number of CIA documents were made public. The documents made it clear that the American intelligence community made use of a number of former Nazi operatives in their cold war battle against the former Soviet Union. Ms. Lipstadt’s research points out other players in the game of helping Nazis escape capture and punishment. The government of the Vatican state and the new government of Germany are just some of the others. The Eichmann Trial does not restrict its focus to the trial itself. Ms. Lipstadt also points her investigative journalism spotlight to the hunt for the war criminal. The roles played by Simon Wiesenthal and others are described in detail. For example, the author points out that famed Nazi hunter Wiesenthal’s information played a much smaller part in the capture of Eichmann than the world was led to believe. The moment when Eichmann, living in Argentina and employed as a lowly line worker in a Mercedes Benz factory, is captured by a team of Israeli agents plays out as both dramatic and anti-climactic. The prisoner, a man who sent uncounted numbers of people considered enemies by the Nazi regime to their deaths, becomes a trembling and subservient creature. In addition to the circumstances surrounding the finding and arrest of Eichmann, The Eichmann Trial devotes much attention to the political storm the capture and ensuing trial provoked, both internationally and in Israel. The reactions ranged from legalistic debates to waves of raw antiSemitism. Debates also raged, both in and out of the courtroom, over Eichmann’s true role in Hitler’s “Final Solution” to the “Jewish problem.” Ms. Lipstadt uses her research skills to dismiss political philosopher Hannah Arendt’s famous “banality of evil” description of Eichmann as a mere clerk in the offices of the Nazi death machine. He was, the author points out, a deeply committed Jew hater who helped plan the basic mechanism of the Holocaust. His crimes, according to the charges that made up the basis of his trial, included participation in the extermination of Jews, Gypsies, non-Jewish Poles, and Russians by various means, and the plunder of the property of those he had imprisoned in death camps or executed. The Eichmann Trial is an important historical document. It raises many questions, but it answers even more. Ms. Lipstad’s central idea is that the 1961 trial in an Israeli court changed things for both Jews and non-Jews because it gave the survivor generation a process and a listening audience. It made their voice audible to their grandchildren and to the generations that follow. Ms. Lipstadt dedicates her book to a guard at the United States Holocaust Memorial Museum where she did much of her extensive research. During the period when she was an almost daily visitor to the archives of that museum, a hate-filled fanatic attacked the museum and gunned down their guard, Steven Johns. In the light of the January 2011 killing spree in the state of Arizona, her description of the killing and her dedication have particular significance.